They performed the play 4 times in 3 different locations for a total audience of over 1,300 people. All tickets were free of charge. The Wilder Family spoke with the director of the production, John Christian Plummer, HVSF Managing Director, Kate Liberman, and Associate Producer Emily Sophia Knapp about how they managed to make this ambitious idea a reality. ﻿Has HVSF ever worked on a project of this scope and scale in the past? How did you dream up this project? Kate: This is the first time we’ve ever done anything like this. The genesis of the idea came from our artistic director Davis McCallum as we planned the 30th Anniversary celebration of Hudson Valley Shakespeare Festival. We were trying to figure out how to celebrate the anniversary in a way that would thank our community for supporting the theatre and reflect back to the community the kind of beauty that we see in the place where we live and make theatre. About a year ago, Davis came back from seeing a performance of Public Works at the Public Theatre. 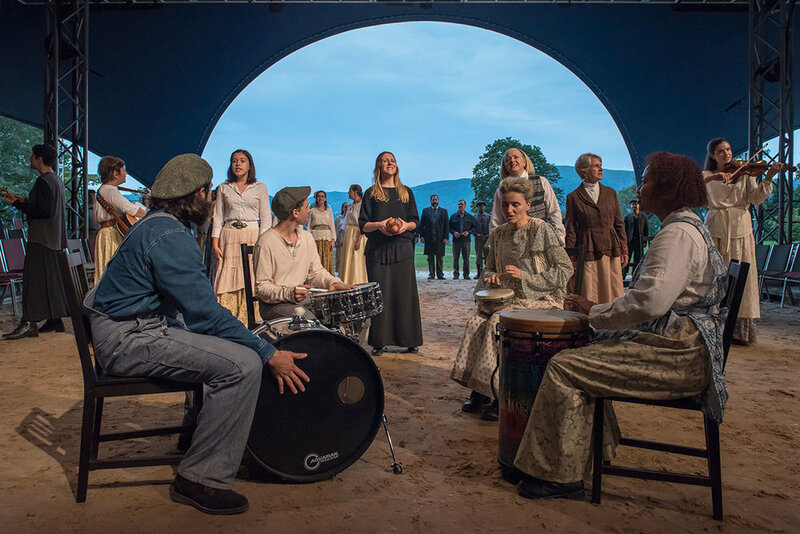 He was so jazzed by what they were able to do by merging community and professional talent, and it seemed like a great way to celebrate our community here in the Hudson Valley as part of the 30th anniversary. Replicating that program would not have worked, but we found a way to create a version that would serve a less urban, very diverse and disparate area. Emily: Well, Philipstown feels like Grover’s Corners. Everyone knows everyone. We all know our village trustees. We know who goes to what church and what time somebody hung their laundry out to dry. It felt really meaningful to produce that play. In addition to involving the community on stage, we also wanted it to be completely free. The tickets “flew off the shelves”-- they were completely “sold out” within 45 minutes of being available online. John, how did you cast the play? Was it difficult to strike a balance between amateur and professional actors, so that it felt like everyone was in the same production? Ryan Quinn is another company member we wanted to involve. Ryan was only available for the last 2 weeks of rehearsal, so we cast him as Sam Craig, the Grover’s Corners boy who goes out West. And that seemed to make sense because he was coming in late, just like Sam comes in late. The third professional actress was an amazing woman named Antoinette Robinson who played Emily. In order to find our “Citizen Actors” we started by offering workshops in 4 different communities: Philipstown, Newburgh, Beacon and Peekskill. We did 2 workshops in each place. And during the workshops, we never even touched the text. They were workshops in fundamental theatre exercises, just to get people to stop thinking and start moving together from the heart. At the end of that, we talked about the play and we talked about the process. We had 230 people come to these eight workshops, aged anywhere between 10 and late 70’s. The people who came were ethnically diverse, socio-economically diverse, and diverse in terms of gender identification. It was phenomenal. For example, we found a guy called Tim Harbolic to play George who had some improv-comedy experience. He’s a young John Goodman or James Gandolfini. He’s built like a football player, so not necessarily a casting director’s first choice for George in terms of “type”. But like those two actors, he has so much heart and so much sincerity. Tim and Antoinette had great chemistry together on stage, as did the actors who played Doc Gibbs and Mrs. Gibbs, and Mrs. Webb and Editor Webb. I had so many audience members come up to me afterwards asking which of the actors were the professionals. They couldn’t tell. This company blew me away. I would put these guys up against anyone. If there were an Our Town Olympics with different companies entering, I would enter this one and expect to win the gold! How did you rehearse this behemoth? John: Ultimately we did not have very much time. We took about a month off between the workshops and starting rehearsals, and we asked everyone to just read the play out loud as often as they could in preparation. It was clear when they came to that first rehearsal that people had been reading the play a lot, because they were so connected with each other and the play. We started rehearsing regularly in July, 2 or 3 evenings a week for 4 hours a night, and one day on the weekend. Then in August we rehearsed 3-4 nights a week and 2 days on the weekend. At the start of every rehearsal we’d begin with a few exercises. We’d meet in a circle, make eye contact and go from there. Sometimes we’d do an hour of excises, just wacky, crazy stuff. In fact, this one guy who had been in the military was in the cast and on closing night he came up to me and said, “I couldn’t figure out what any of this stuff had to do with doing the play! But eventually, I realized, this is just like basic training! You’re breaking us down! You’re trying to break all of our bad habits in order to unify us. Because that’s what it was like in basic—we had to become a unit.” And said, yes. That’s exactly what we’re doing. But for peace instead of war. What was your biggest take away, for you personally and for the theatre? 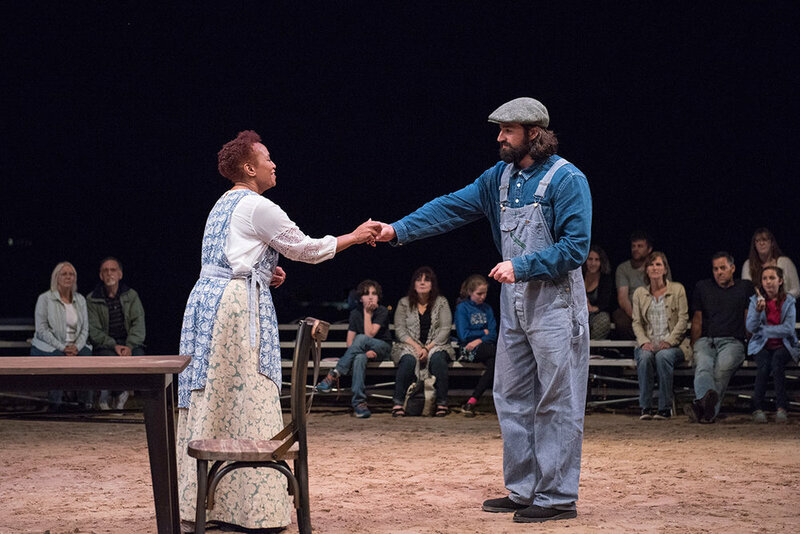 Emily: At the end of process, we asked people to write about their experience and one of the questions we asked was, “What will you remember 1000 days from now about Our Town?” Three people wrote about one specific moment at the very end of the play. John had the dead seated on stage with Emily. The lights came up very dimly, right at the end of the stage as the Stage Manager walked out toward the bluff, and all of a sudden you saw that the entire rest of the cast was also seated at the back of the stage, extending the graveyard off into the horizon. People wrote that their favorite moment was sitting in their chair, waiting in the dark, looking up at the stars about the venue. I thought that was such a beautiful metaphor for that intangible thing you can never explain to someone about what it feels like to be in a play, to know that you are part a team and a small part of a something much larger than yourself. And because of this interesting mix of community members and professional actors, talking about Grover’s Corners, but describing things that are exactly what we see in our town, people were having real experiences. They were looking up at real stars, not just pretending. How do you plan to maintain the connections you’ve created with the community going forward? Kate: Well, this project happened at the same time as Davis and I were working on a strategic plan for Hudson Valley Shakespeare Festival. And as Davis described it, the Our Town project was kind of like sticking our fingers in a socket and realizing that we’d hit on something big. …Though I’m not sure that’s exactly the right metaphor! In the last five weeks, community engagement has made its way into all levels of this strategic plan. That’s become a bit of a buzzword in the theatre, but for each community, it means something different. We’ve been able to see what the Public Theatre does in a place where there’s public transportation and a subway that connects all five boroughs. But here in the Hudson Valley, we’re working with five disparate communities where transportation and communication is so fundamentally different. Despite those challenges, Emily and John made this production work so seamlessly; we want to see how we can continue to do this in different ways and what that means for us. While we can’t innumerate the 10 ways in which we will achieve this, we certainly want to find ways in the coming years to continue to involve our community on stage. We want to continue to find ways to run on the energy that Our Town built. 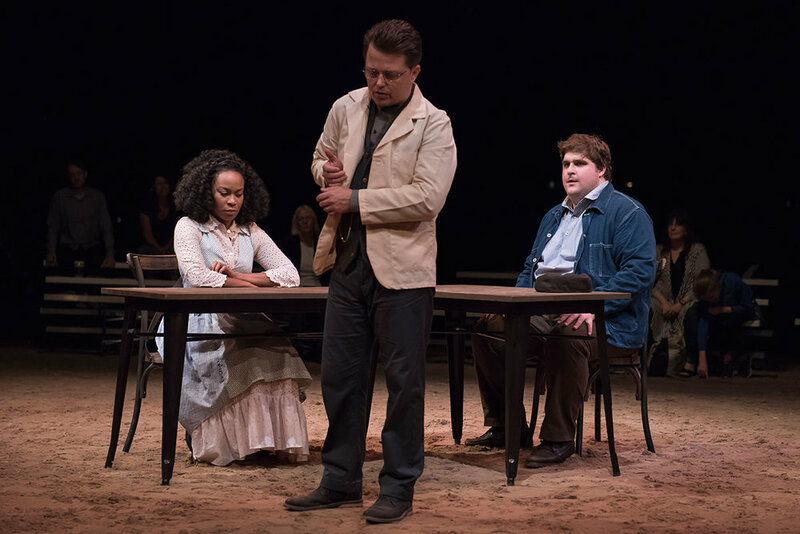 Emily: This play is about dissolving borders—borders between life and death, between men and women, between communities. The towns around where we live also feel very separate, so we saw this play as an opportunity to bring together lots of different kinds of people across borders. John: So much of this play is about the porousness of borders. I tried to demonstrate that through the cast, by having amateurs and professionals perform together. The origin of the word amateur is amare, or “to love” and professional originally meant “ “a spiritual person” or “one who professes” and it wasn’t until the 19th century that it came to mean “people who got paid for doing their job.” Those two things are really connected—one who loves and one who professes. They profess based on their faith, which is love. There’s really no difference. Emily: If we had to this to do again, we’d do more shows. We had a huge problem with scarcity of tickets. In a way, our ability to be really welcoming to the whole community would have been greater if we’d had more performances and more tickets to give. Kate: And that was compounded by the fact that we had a cast of 40 individuals who, of course, all want their family and friends to see the show so that’s 200 tickets right there. Our home theatre is an outdoor theatre, under a tent on this beautiful bluff that overlooks the Hudson River. We did two of our performances in our home venue, but then we also took the show for one night only to venues in Peekskill and Newburgh. Each of those performances were so unique, in terms of who came out to see the shows, the way that the actors engaged with the community, and how the spaces worked differently with the show. Transportation is a big issue here, and this production provided access to so many more people. As much as it would have exhausted our company to do another week, it would have been wonderful for the community to be able to perform in one or two more venues in other neighboring towns. John: If this program were to be successful again, you’d have to start with the play. This play is an absolute a masterpiece, on the level of Shakespeare. There are layers of meaning and intent and interconnectedness in the dialogue, the things that are so seemingly mundane, yet so profound. Like in the first act, with the Stage Manager says, “The morning star always shines brightest just before it has to go. Doesn’t it?” It’s a reference, of course, to Emily, the brightest girl in class. That’s what I mean by a masterpiece. And as a result, a company will rise to the level of the play.